The '800 Challenge' - Southern Africa: Don't judge a bird by its colour! With Alisha away on assignment for a week our 800 Challenge has, by implication, been temporarily suspended... Even so, as the sedentary parent in the house and in the interests of a sound body & mind, I thought it my duty to tag along with Sean, my 12 year old, to catch, photograph and record 'anything-that-moved'. He forbid me my iPod, iPad, PSP, Wii U & Xbox which I was compelled to leave at home; nasty brat ...! Pioneered here, the concept of Citizen Science continues to play its part in the mapping & conservation of a vast diversity of species. Unlike elsewhere, ordinary laymen & women are encouraged to record and document species under review. Birds in particular and the associated mapping of range-shifts play a very important role in the conservation effort. 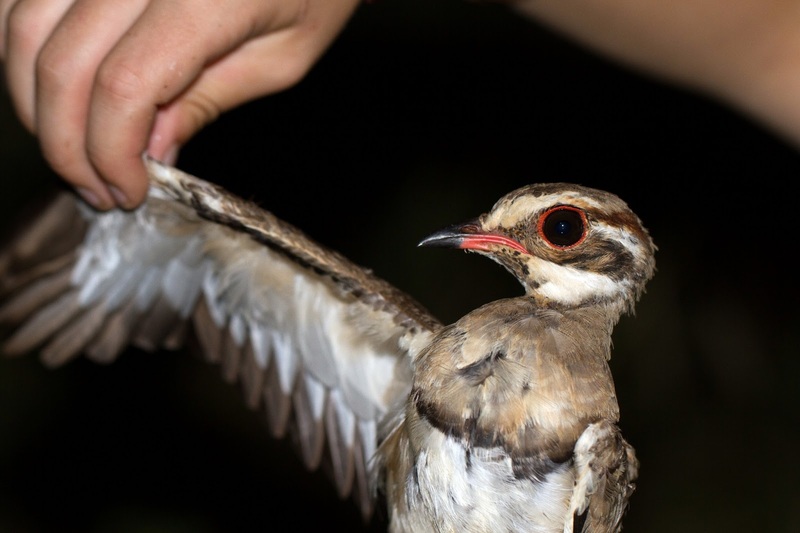 Our contribution to Citizen Science, supervised under the Code of Ethics as prescribed by SAFRING [South African Bird Ringing Unit], involves the safe-capture and release of birds; the subsequent marking of each individual with a numbered leg-ring and the recording of morphometric data. The data helps map the bird's movements, dispersal, life-expectancy & breeding success etc. over time. Limited largely to weekends and having spent as much time as we have on our 800 Challenge, we've had little time to pursue our bird-ringing or banding passions.Whilst Alisha's hard to beat with a net & light, Sean has participated in so many of these nocturnal excursions that he's as handy as most whenever assistance is needed. 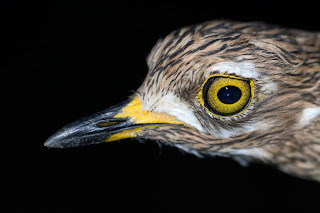 It wasn't long before we'd caught & ringed Bronze-winged Courser, Spotted Eagle-Owl, Rufous-cheeked Nightjar and Spotted Thick-knee. The conservation benefits are a given but the real spin-off for the individual, doing the ringing, is so much more. It's only when you hold a bird in hand and are obliged to accurately identify the bird before ringing that you truly appreciate the subtle diagnostics largely missed through the glass. Our evolution as birders, if you like, we describe in three phases. As beginners we employed colour-coding to identify our birds. We called this our Bee-eater phase. That worked well enough for birds readily identified by colour-scheme or pattern. LBJs [Little Brown Jobs] were a step too far for our Bee-eater skills. As a consequence we were dragged unceremoniously into phase two, our Fish-Eagle phase, where we learn't to separate 'Cloud' from 'Desert' & 'Marsh' from 'Reed' on call and behaviour alone. That's fine in the breeding season when birds are calling ... At other times of the year the Silence of the Birds becomes confusion. 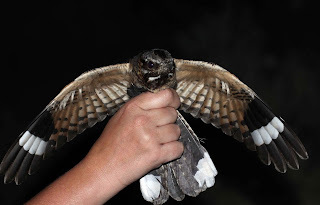 Phase 3, our Nightjar phase, has forced us to understand morphometrics and other subtle diagnostic features that readily separate 'Marsh' from 'Eurasian Reed' and one sub-species from another. These skills we continue to learn each time we step into the field especially when the birds are in-hand. I suspect there is much more to come.. Between Sean & I we racked up close to 300 species of birds, insects, butterflies, dragonflies, mammals & reptiles this last weekend. The highlights were many; the time spent with my son, priceless.